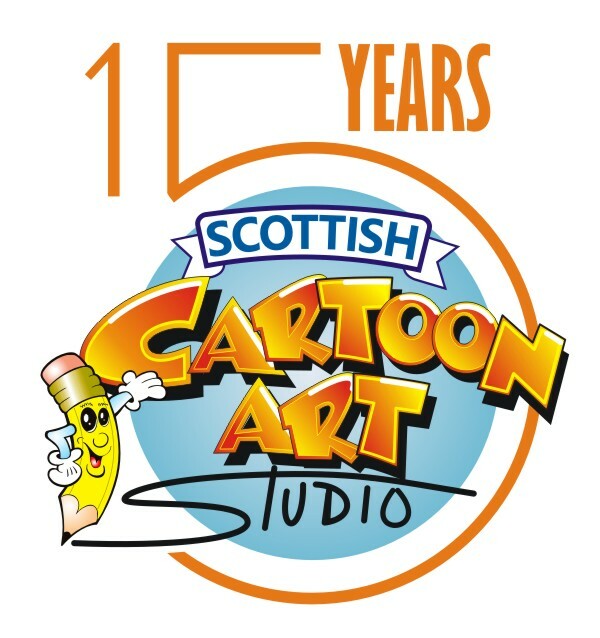 This weekend the Scottish Cartoon Art Studio team are delighted to reach fifteen years in the business of cartooning. NB- Facebook users receive a discount on gift caricature commissions throughout May. Our big anniversary year will include a number of exhibitions and events. We’ve already begun touring of our new show on the topic of the Scottish independence referendum, The Auld Acquaintance. It’s currently open in France and will run until the 14th of August. Details of where in Europe the it’s going next will be announced soon. In addition some of our Fizzers® caricatures have formed part of recent exhibitions in Edinburgh and Stranraer. As usual our caricaturists will be appearing at a variety of events during the summer season, drawing children and adults at sporting fixtures, festivals and gala days. We’re finalising the schedule now and will post it here on the blog at the end of the month. We’d like to thank all our customers for their business over the last decade and a half including the loyal regulars who have returned again and again. Also our friends and family members who have kindly supported us, most especially the ever-patient wives and partners.